Under the dry and unapologetic stare of the mid-afternoon Chennai sun, I approached an informal waste worker, Durai, who I see frequently in the middle class neighbourhood of Mylapore. I handed him a bag of cans and plastic bottles accumulated in my flat over the past month and asked if he would be willing to let me shadow him as he went waste picking. Durai graciously obliged, after overcoming the initial confusion and suspicion, and we set off together. Unlike some of the other informal waste workers to whom I’ve talked, Durai had no tricycle or cart, only a white burlap sack and a wooden stick he uses to poke around and help pick up trash in dumpsters that were not too full. Durai had started at 11 that morning in the neighbouring area Alwarpet, sold what he found, and had a one rupee (US$.02) lunch at the government-sponsored canteen before setting off again. He would prefer not to go around during the afternoon because of the relentless heat, but also because the trash gets cleared around 1 or 2 pm and good finds are harder to come across. However, as I’d see for myself, most of the informal waste workers, at least in this area, stop during this time so there is less competition for him. Additionally, it is the time that school lets out and people tend to have their afternoon tea and snacks, which means there will be a fresh supply of trash to pick through. For instance, we walked by a secondary school which is flanked on either side by small shops, including a Kwality ice cream stand, a cafe, and a pawn shop [small convenience store]. As I noticed in the posher neighbourhood of MRC Nagar, the temporal release from school signals a spatial redefinition of the surrounding area from an educational institution to a space of consumption and leisure. Durai reclaimed a few soda cans, several thick plastic bags, and small cardboard candy cartons just in front of an unofficial dump near the school. He doesn’t waste too much time with the cans usually because the margins are low, but he wanted me to see how many different things can be collected in that particular area. We walked down past the more middle class area towards a nearby slum, where there was a lower concentration of plastics but he was able to find some newspapers, cardboard boxes and milk packets. “It’s usually just food waste in places like this,” he explained, a concept echoed by waste management officials to whom I’ve spoken with as well. After making a loop around the area, we ended back on a main road, by the Cooum River, once named to denote a well or deep it, but now a name used colloquially in reference to any waste-filled waterway. 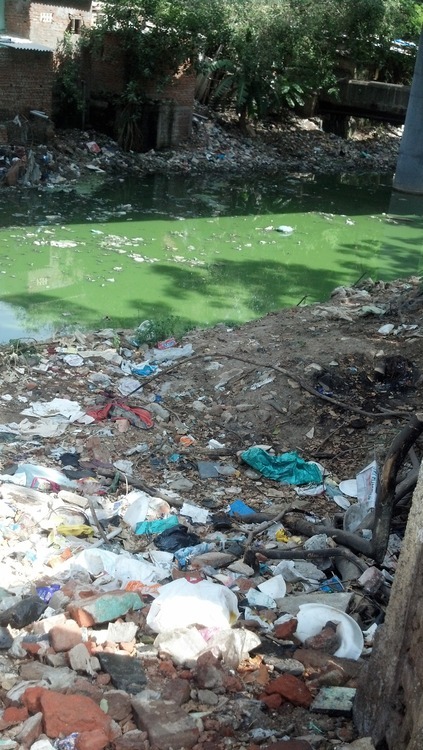 The Cooum River sits still; there’s no movement beneath the layers of thick, green sludge and the scattered litter nestled inside and alongside the banks. The smell of the sewage and rotting garbage stings your nostrils. People walk by, glancing over at us while covering their noses with handkerchiefs. This entry was posted in Anthropology, Environment, Labor, Recycling, Urban, World and tagged Chennai, India, informal recycling. Bookmark the permalink.